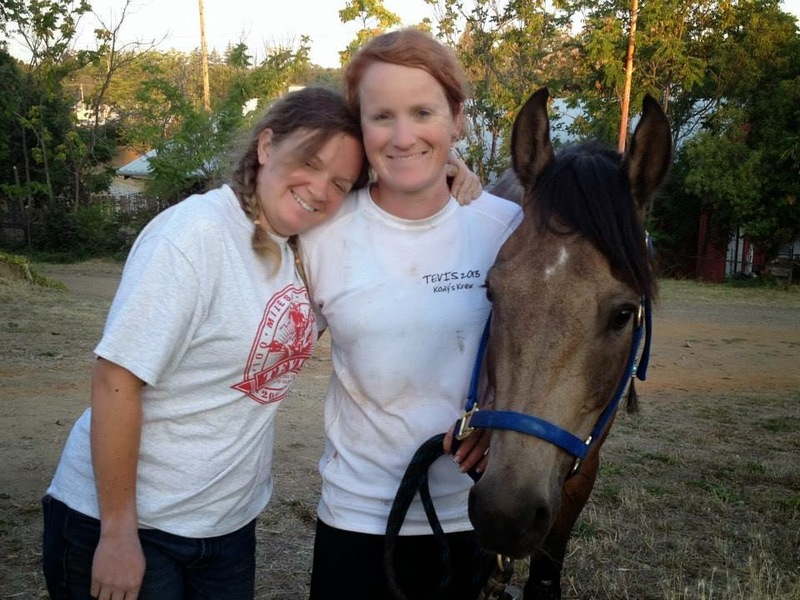 About ten (uhhh…it’s been a standing deal since we were about 15…so more than 10…) years ago, two girls agreed between themselves to crew for each other when they would ride Tevis. Never mind neither of them actually had a Tevis horse at that time, or had even ridden a 50-mile endurance ride. Kaity Elliott and I were those two girls. 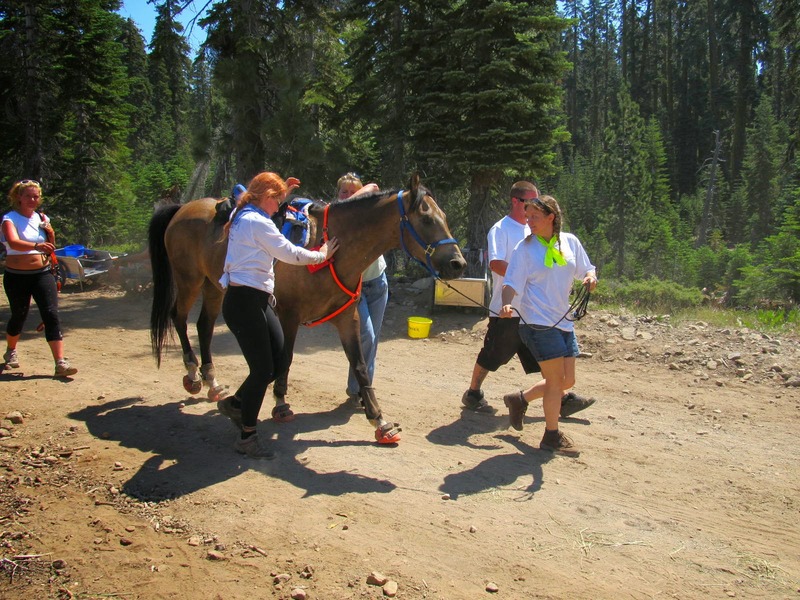 July 20, 2013, I was the first one to fulfill the crewing agreement when Kaity rode her horse Kody through their first Tevis…and first completion. 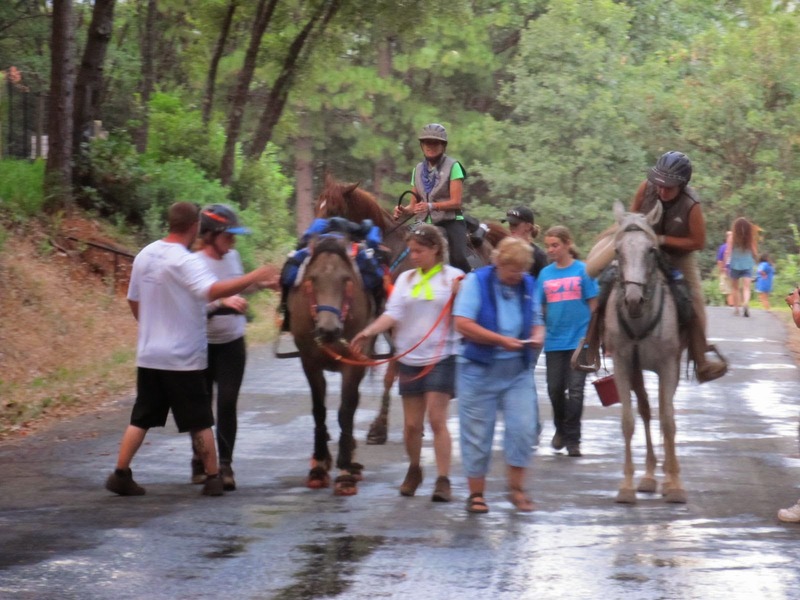 I already went into detail about the Wednesday before Tevis pre-ride in which I borrowed Lucy‘s pone Roo and got to ride from the Finish to No-Hands Bridge and back. Thursday was the day dedicated to packing and prep. 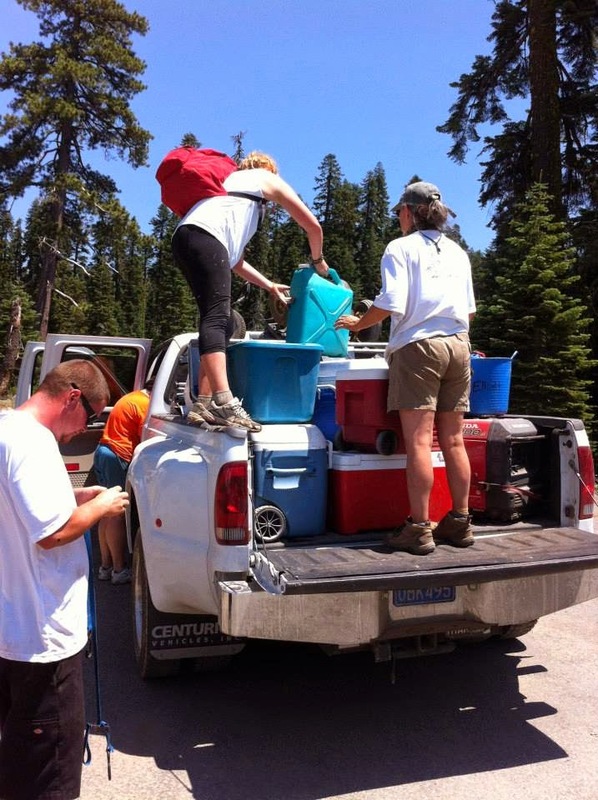 In order to comfortably accommodate rider + crew, as well as for faster set-up and break-down time, we were taking Lucy’s rig, a 3-horse semi-LQ gooseneck, plus Lucy’s Subaru Baja as the crew car. So we went down the list, pulling what we needed from Kaity’s trailer and transferring it into Lucy’s, and double-checking things that Lucy had that we didn’t need to pack. We also hitched up the truck + trailer…a first for both of us, as it was a gooseneck trailer, and it happened with a minimum of drama and colorful language. Slightly more drama was involved when it came to moving horse feed, in the form of an entire fluffy bale of bermuda hay exploded over Lucy’s driveway…much colorful language was uttered at that moment, as the poor bale of hay turned into the outlet for all pre-Tevis stresses and nerves. Eventually we got it together (figuratively and literally), got the hay packed in such a way it probably wouldn’t completely blow out of the truck before we hit Robie Park, then ran into town to grocery shop. The rest of Thursday was spent with more packing, and organizing. 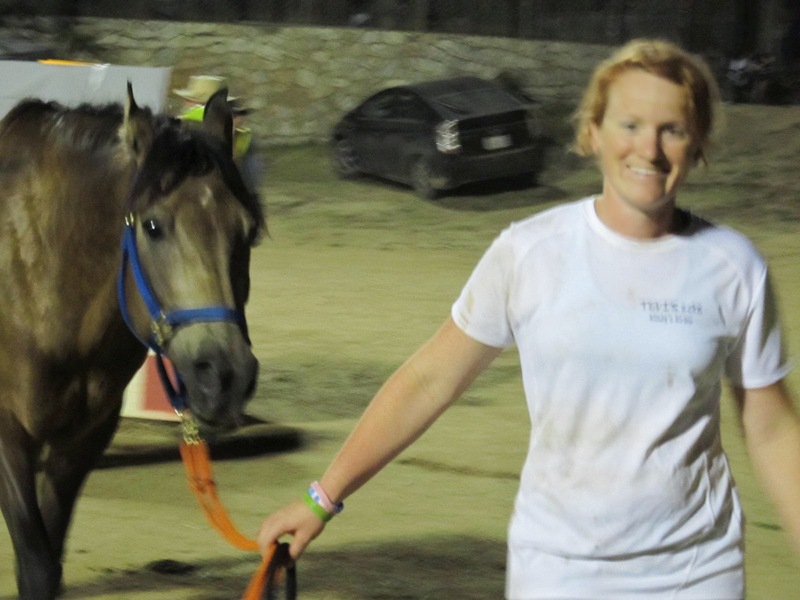 The rest of Kaity’s crew, in the form of boyfriend KC and sister Brenna, arrived late afternoon. Lucy brought home pizza, and I’m pretty sure a semi-reasonable bedtime was managed by all. On the road to Robie, precious Kody cargo in the trailer. 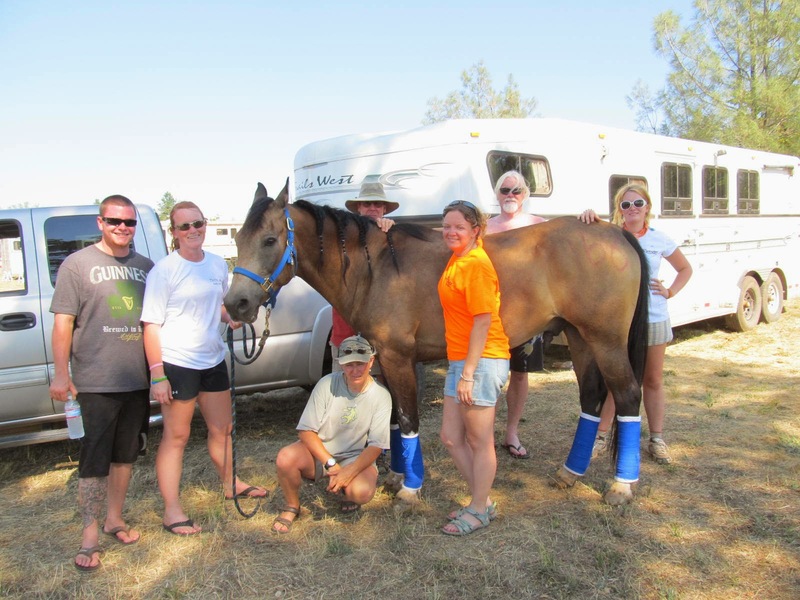 We caravaned up to Robie Park late Friday morning, KC, myself, and Lucy’s friend Sally (another Tevis rider) in the Baja crew car, and Kaity, Brenna, and Lucy in the truck with Kody ensconced in the trailer. The drive up to Robie Park is so gorgeous. I love that I-80 drive, with all of the trees and mountains. The dust on the last few miles in to Robie Park was, as always, impressive, and KC and I belatedly remembered Lucy’s comment that the Baja A/C was out…so we either rolled down the windows and got dusted out, or rolled up the windows and sweltered. We compromised for partway rolled-down windows and a light dust coating. No photographic evidence of my shopping expedition. Before too long, Kaity was back, and we got Kody untacked and Kaity vetted him in. 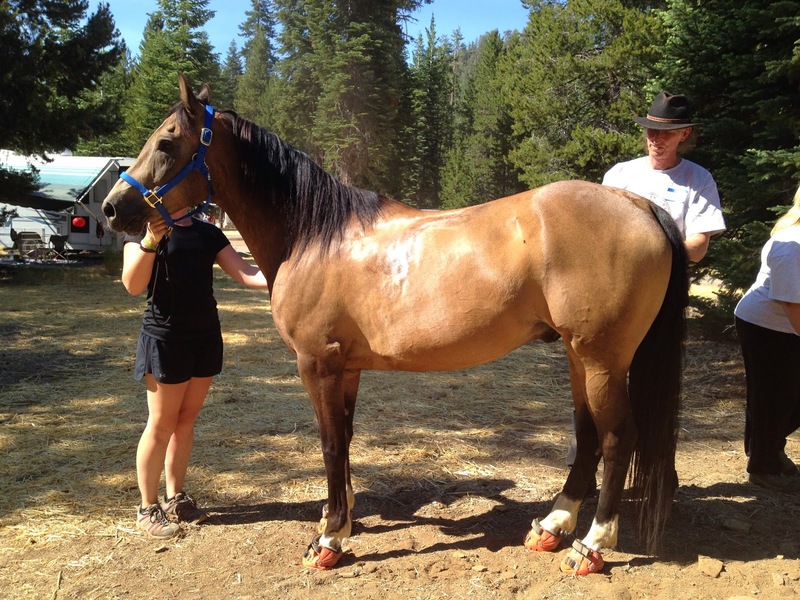 After getting Kody settled back at the trailer, we hoofed it back down (so. much. walking. It really helps, as a crew person, to be in decent shape for this ride.) to the dinner and ride briefing. I’m always a bit shell-shocked by how big the briefing is. So many people, between riders, and crew members, and volunteers, and management. And I’m always surprised by how short the ride briefing really is, when you get down to it, especially considering how large and important of a ride it is. I know I’ve done local rides that have had a longer ride meeting than Tevis. We had pretty much everything packed in the crew car ahead of time, so we wrapped up with a last-minute mini crew briefing of our own, and retired to our respective sleeping spots. Honestly, I’m pretty sure sleep at Tevis is highly overrated, even for crew members, as I don’t ever remembering really sleeping well until it’s all over…and then it’s the sleep of the dead for 10+ hours, usually. 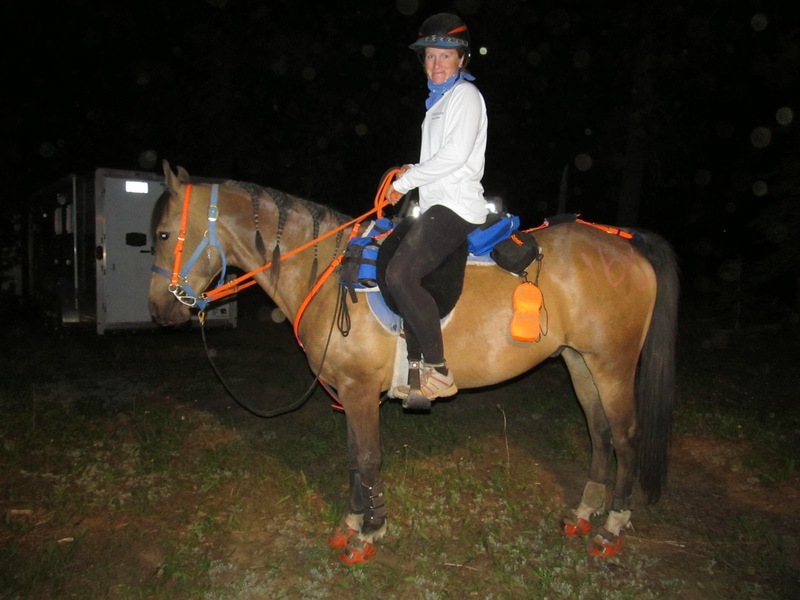 Fortunately KC had coffee brewing (if I must do mornings, caffeine is an absolute necessity), and we got the pony fed and dressed…and the girl fed and dressed…and then it was time for Kaity to mount up and head down to the start. 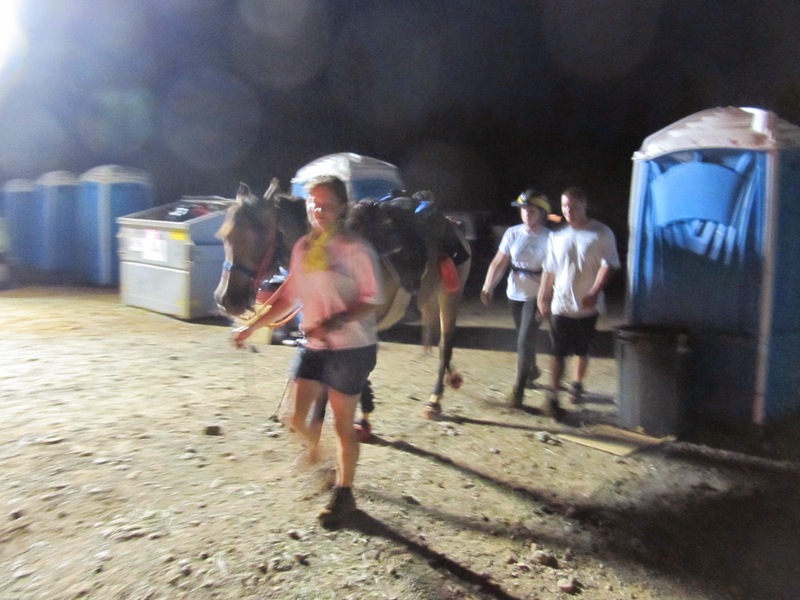 Lucy and I walked with her (and I proceeded to find every rock, hole, and tree root to stumble on in the dark), and hung out off to the ride until they released the Pen 2 riders, then we hustled back up to the trailer where KC and Brenna had packed things up and were waiting to go. Vehicles can’t start up/leave until 5:30, since riders leave on the same road out of Robie Park, so we twiddled our thumbs until the appropriate time, then joined the Great Trailer Race back down to Auburn. 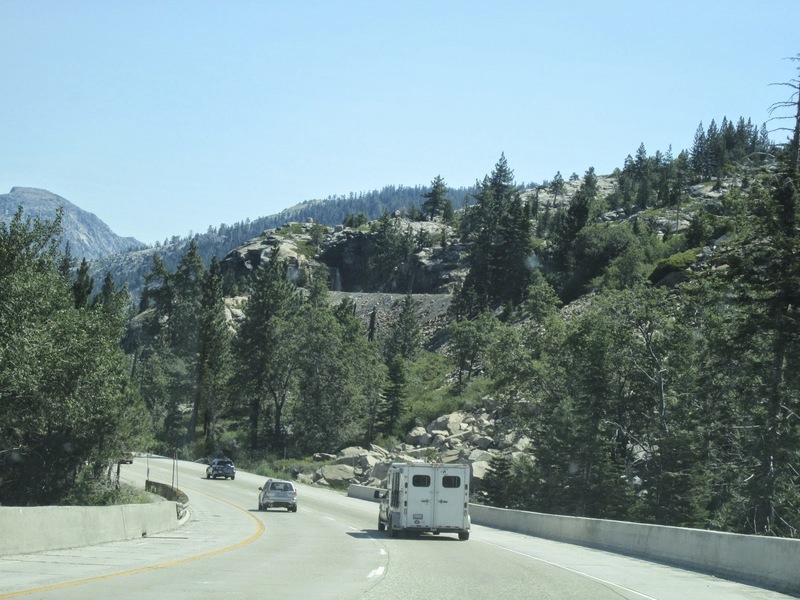 Anyone who has crewed Tevis will remember this…a several-miles-long line of trailers and cars, bumper-to-bumper, and a line of dust that can probably been seen from several miles away. Since KC and I had the car (and could drive faster than the faster speed limit than vehicles with trailers), we zipped ahead, down I-80, and stopped for gas/Starbucks while Lucy and Brenna proceeded directly to Foresthill. We actually caught up with them several miles out from FH, so just followed them right in, where we found a pretty awesome parking spot for the trailer that was not only easy to find (“directly under the cell tower”), but would be easy to pull the rig out of again. Rig parked, we all jumped into the car and headed up to Robinson Flat. 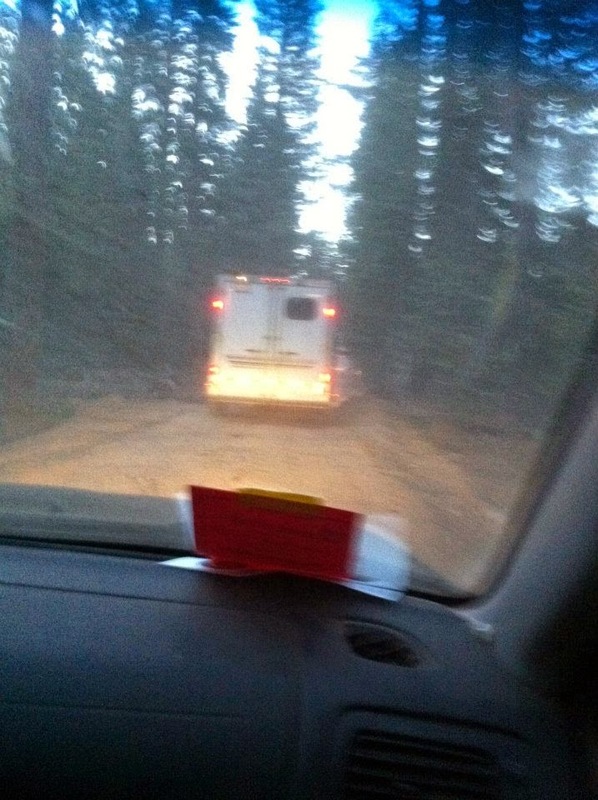 Once there, we hit a minor snafu in that, unbeknownst to us (nothing was said/published about it), they shut down the caravan line (that would allow you to drive up to the top, drop people/stuff off, drive back down and park, and have the driver walk back up) at 8:30. It was 8:45 when we got there. We were furious. Especially because Kaity believes in being…ummm…”well-stocked” with supplies, so it wasn’t exactly as simple as hauling one little crew bag onto the shuttle bus and being done with things. Well, we made it work…ended up being the last people on the bus, wedged in with a ton of stuff…and poor KC had to start hauling the (non-folding) cart up the mountain. The bus dumped us off at the top, and Brenna and I proceeded to haul stuff by hand (but we found a killer crew spot…and no, I’m not sharing where ;)) while lucy headed back down to help KC. Fortunately a kind person who had permission to be driving on the road back and forth stopped and put KC and the cart in the back of their truck and drove him up. We got the crew spot laid out beautifully…buffet for Kody, a chair and cooler full of food for Kaity, then headed up to the road the riders come in on to wait. so I distracted with a pan of sloppy and he didn’t even protest. Post vet exam, I whisked Kody away to our crew spot and set him up, first with his hay. (Rule was he had to eat some hay for forage/fiber first, and once bored with that, he could have his beloved sloppy.) As he munched, I worked on sponging the worst of the grime off, and checked to see if I needed to do any boot adjusting. to check for color and volume. Crewing is SO glamorous. That hour hold passes by really fast (although fortunately Kaity didn’t have to wait in long lines for P&amp;R or vet), but we got her in the saddle and out on time. 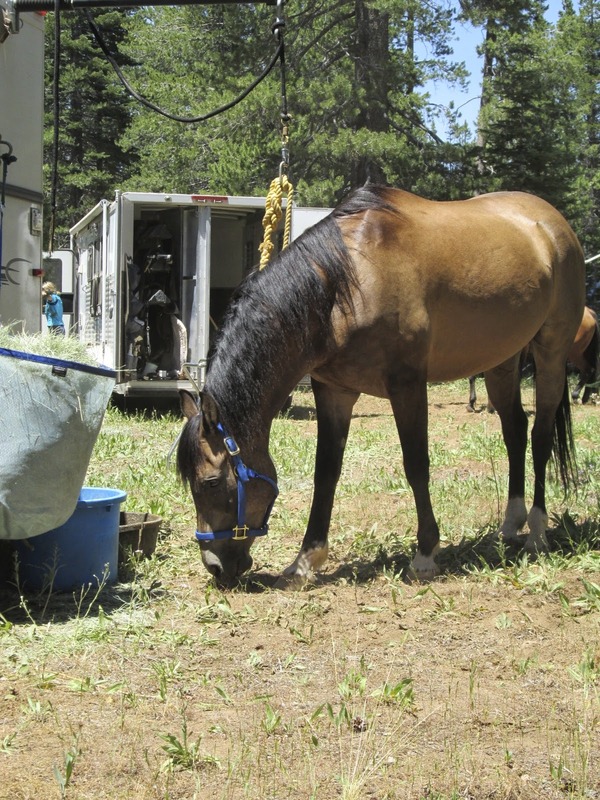 Between Robinson Flat and Foresthill is a long stretch of downtime, as it’s probably at least 6 hours before you’re going to see your rider again. Lucy headed back out to go to the Chicken Hawk check (a gate-and-go-style of check, but it’s apparently nice to have a smiling face and extra set of hands meet you there). We got the back of the trailer swept out and the shower area all set up and ready for Kaity to use. I arranged the crew cart with everything we would need for later, then wandered around a little bit looking for people I knew, including Funder, crewing for Mel, and A, crewing for Karen. I loaded A down with more Renegade goodies and we chatted for a bit before she had to go. Around that time, Kaity’s parents showed up, so I spent some happy time catching up with them (again, known them as long as I’ve known Kaity and they’re sort of like another set of parents to me), and then her dad and I drove down to the Foresthill market for ice and provisions re-stocking (more Gatorade). After we got back and hung out around the trailer a little more, Interesting Things started happening, which meant riders were starting to come in. I wandered down to Bath Rd to watch and cheer, since it was still at least a couple hours from when we anticipated Kaity arriving. see how we’re a blur of motion? 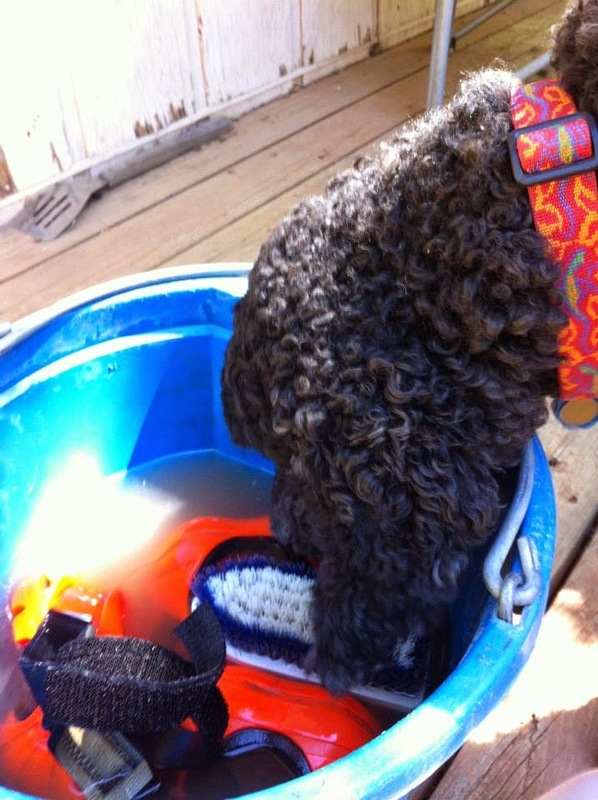 We stripped tack, and started cooling — water is plentiful here in FH, including a hose, and the ice I’d fetched earlier. It was HOT this year, and we did some pretty aggressive cooling/hosing/sponging of ice water on Kody as we headed up the road. 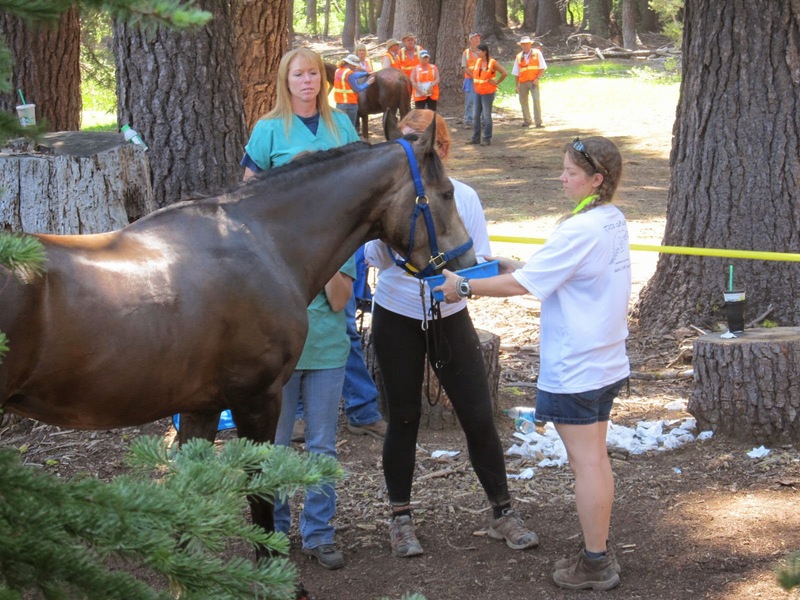 It worked, as he pulsed right in, and Kaity and I headed over to the vet line. 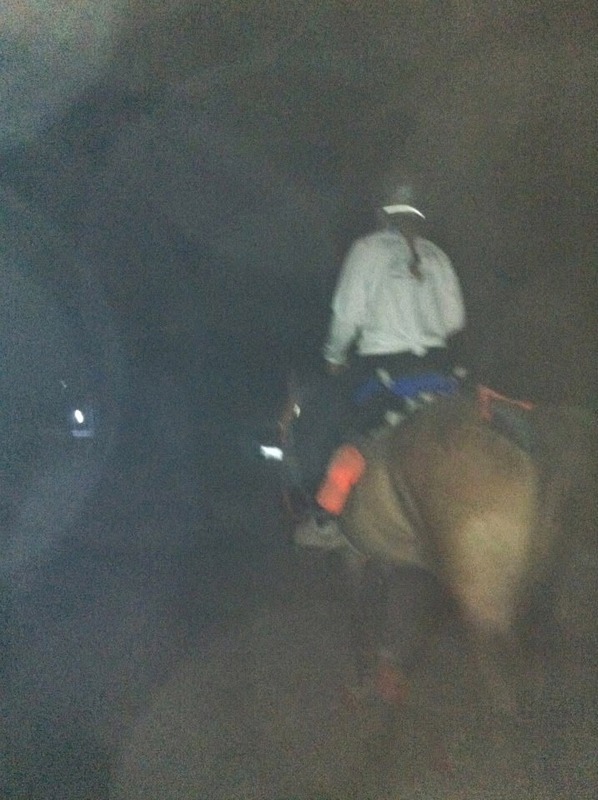 After a successful vet exam, we went back to the trailer, where Kaity was shoved to the back of the trailer to shower, and the rest of us worked on getting tack set up for nighttime (glowsticks, headlamp) and I messed with/replaced a couple of boots Kody had pitched in the canyons. 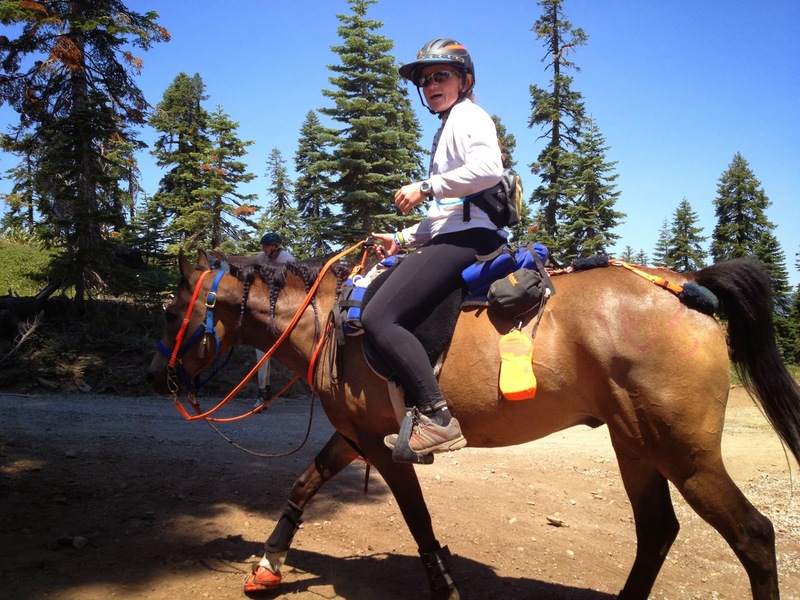 There was a brief delay at the out-timer when the Desitin in Kaity’s saddle pack turned up missing, and Lucy had to run back to her trailer for more, but we still managed to get her on trail in a timely fashion. Once we saw her on her way, the rest of us headed back to the vehicles, packed up what looked like the aftereffects of a tornado, and drove back down to Auburn and the fairgrounds. 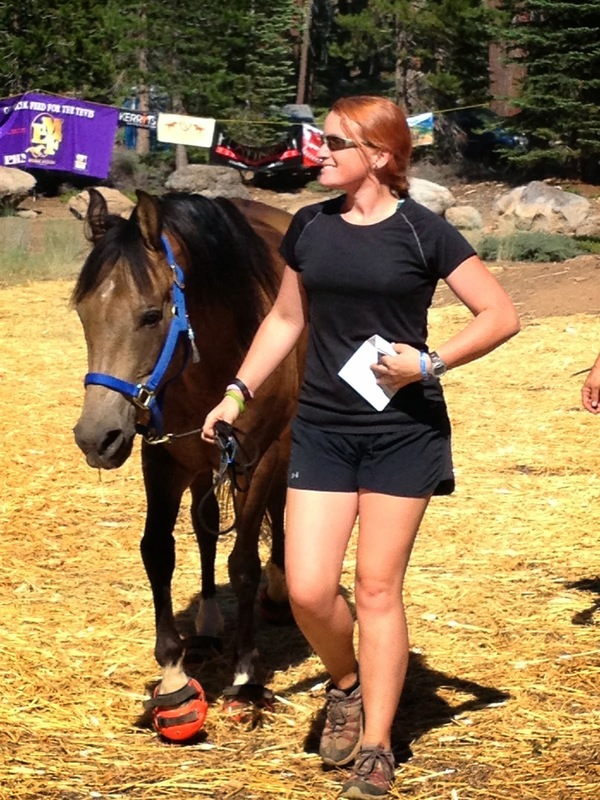 Kaity had gotten one of the horse camping slots next to the finish line area, and we had scoped it out ahead of time. End spot with lots of room for rig, vehicles, tents, and horse. 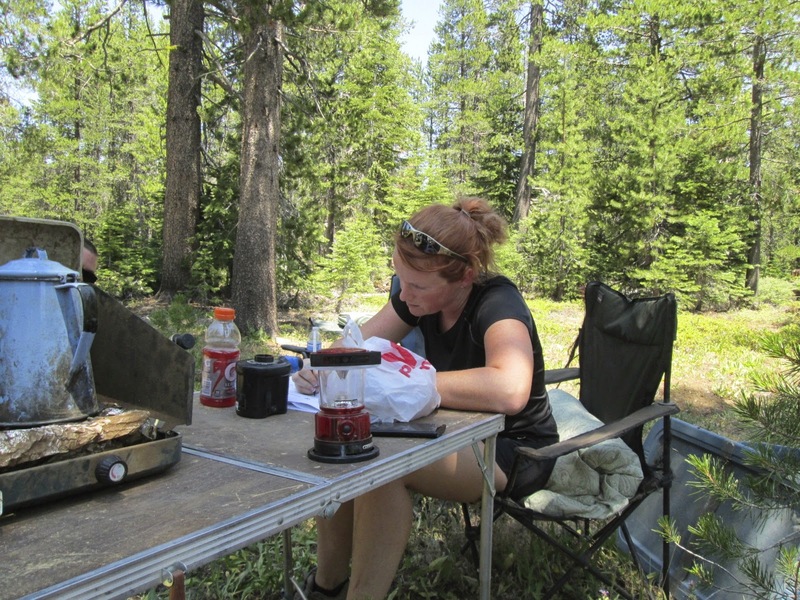 We dropped the rig off and left the camp set-up in the capable hands of KC and Brenna. Lucy and I had volunteered to help work the Lower Quarry check during that “downtime” of dropping off the rig and Kaity’s arrival in Auburn (all part of my plan to see/experience as much of the ride as possible before actually riding it), so we headed down there. We missed the Top Ten riders coming through, but then saw the majorit of the rest of the riders come through in the next several hours. 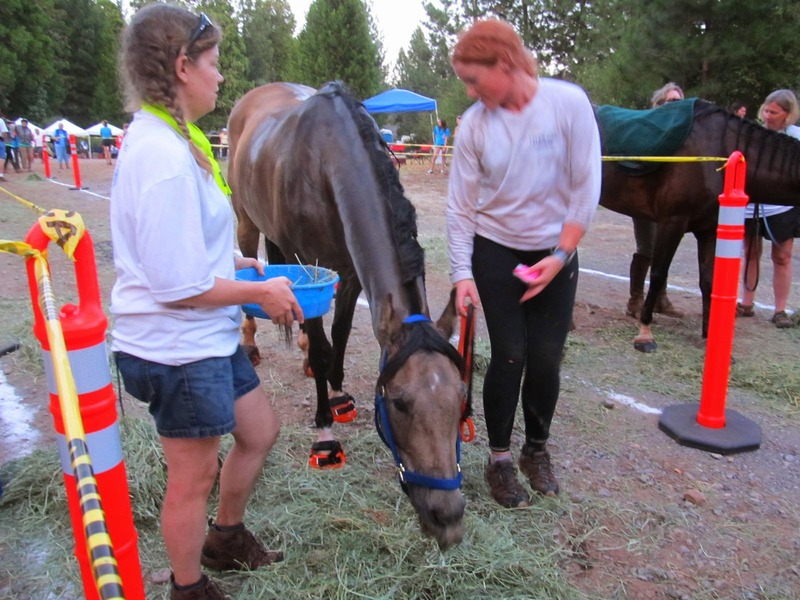 As volunteers, we were basically available to help riders with whatever they needed: hold their horse, cool/sponge them, provide hay/mashes, refill water bottles, point riders in the direction of the food table, do a courtesy pulse check. 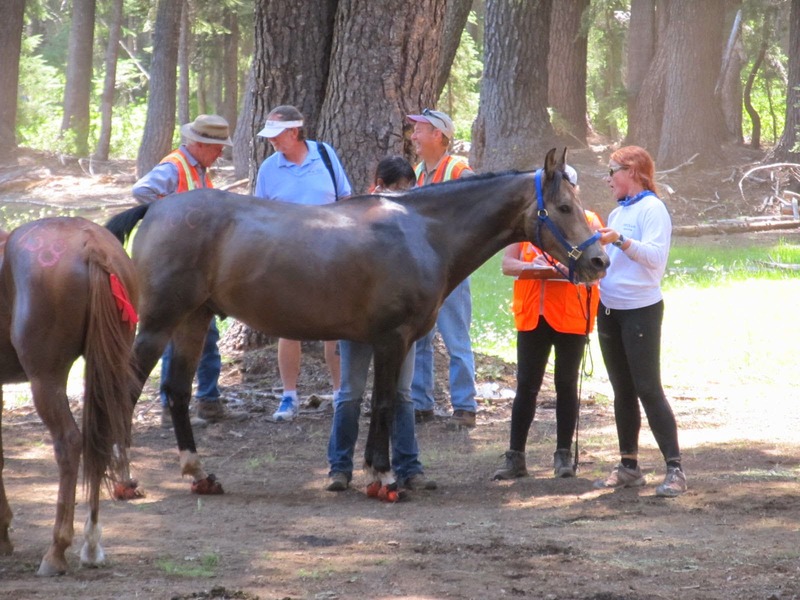 It was really, really fun to interact with so many different horses and riders and help them, in some small way, with their ride. We offered Kaity the same basic services as everyone else (since crews are not allowed at Quarry), and after she was through the check and on her way, we made our exit and booked it up the road. 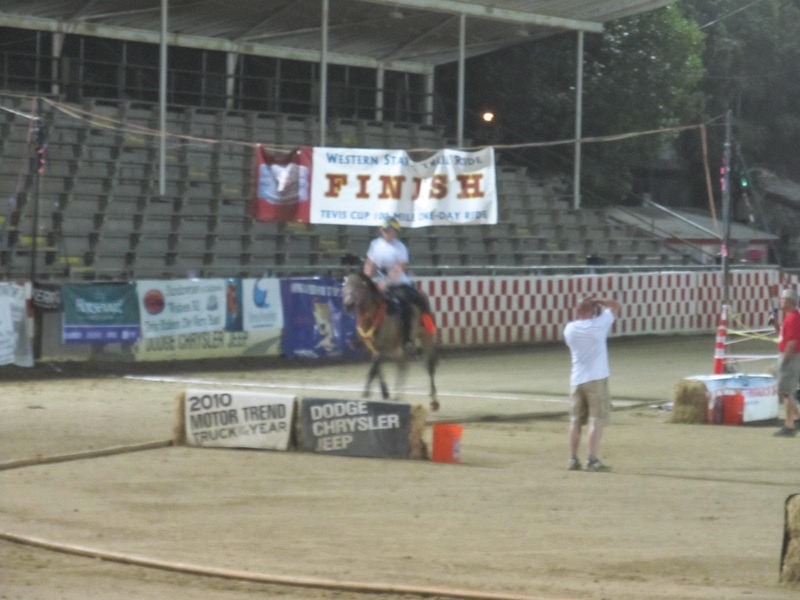 We managed to hitch a ride with some volunteers who were driving out, so we didn’t have to jog/walk the whole way back to the car, so we had plenty of time buffer to drive back to the fairgrounds and settle on the “grassy knoll” overlooking the finish line at the water trough. Crewing wasn’t allowed until after riders were through the stadium, so we waited for her to arrive, cheered like a bunch of lunatics, and walked with her down to the stadium. I admit it: I cried when I watched them go around the stadium. 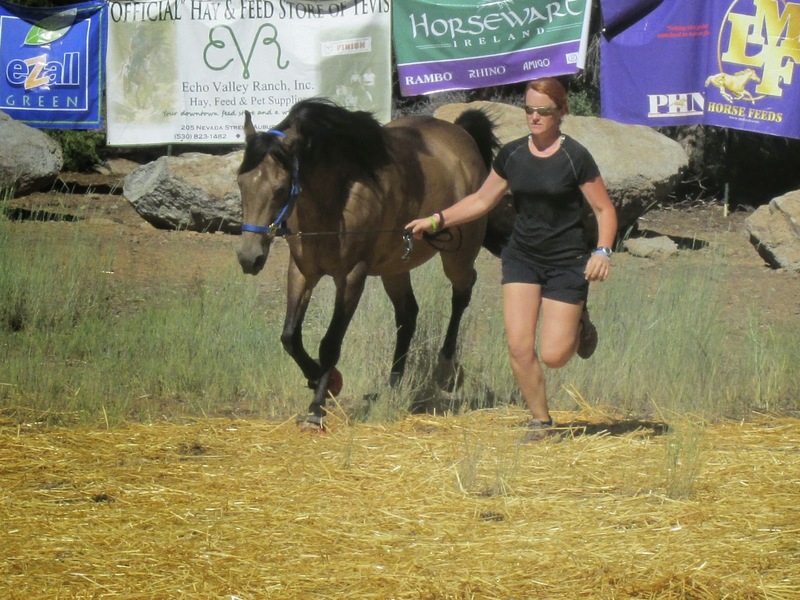 I know this has been a long-time dream of Kaity’s, and to do it on a horse that she raised up from a fuzzy baby to a beautiful, grown-up, 100-miler TEVIS HORSE is an accomplishment that goes beyond description. post-completion exam…a SUCCESSFUL FIRST TEVIS!!! Tevis has been doing a post-post-completion check 1-2 hours after finishing, so we went back up to the trailer where I wrapped Kody’s legs, and by the time we got him all wrapped and clean, it was time to go for the re-check, which we did, then staggered back to the trailer and fell into bed. It was probably around 6AM at this point. (Seeing two sunrises in the course of 24+ hours is a bit much.) I passed out for a couple of hours, but woke up around 8:30 or so feeling like a turkey baking in an oven. (Metal trailer, full sun, closed doors.) 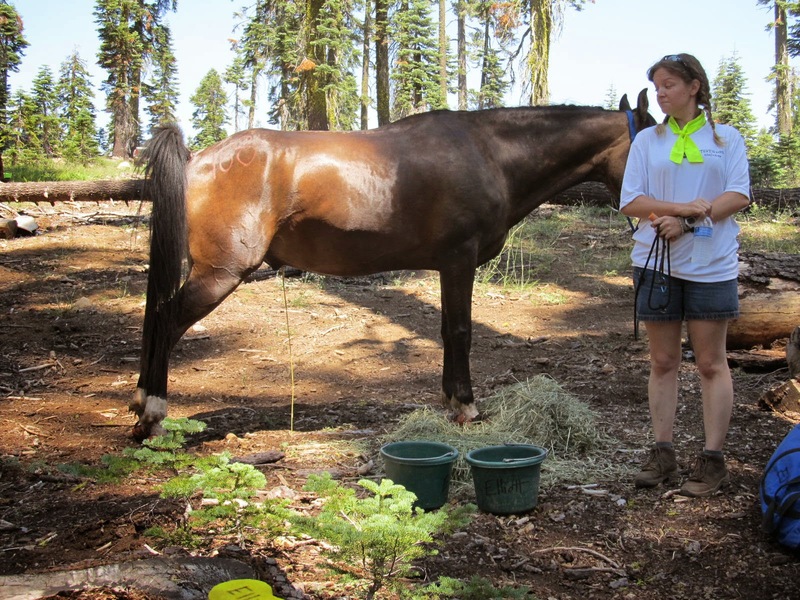 Lucy was also up, so we blearily stumbled down to the showers, washed over 24-hours of Tevis grime off, and searched out breakfast. 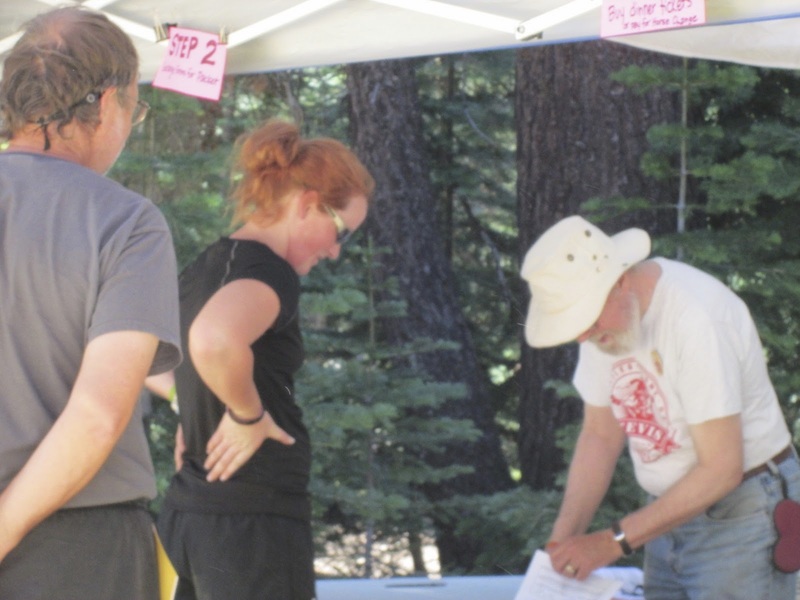 After food (and coffee), we watched the Haggin Cup judging, which is always interesting to see, then we browsed the vendors, looked at ride photos, then lolled about in the shade and grass until it was time for awards. I was definitely done by the time awards were about halfway through…lack of sleep and full depletion of all of my energy reserves meant I teetered on the edge of an emotional breakdown, as all I really wanted to do at this point was go back to Lucy’s and sleep. The rest of the afternoon/evening is a bit fuzzy…I know I got back to Lucy’s, had my private meltdown, then crashed for several hours. I think we all kind of slept in shifts…in typical “me” fashion, I woke up around dinnertime, ate something, then stayed up for a few more hours chatting about all things endurance and Tevis before crashing again. I’d wisely given myself an extra day before having to head home, since I had extra stuff I needed to send home (Renegade boots, shirts, and a saddle I was borrowing from Lucy), so I got to see more of the scenic Sierra foothills as Kaity and I drove to the UPS store (and searched out junk food). I flew back home Tuesday, and promptly spent the next week getting my sleep patterns back in order. Who are you crewing for this year? great story. Brent and I (Kaity's aunt and uncle) really appreciated being able to be at Foresthill while riders came and went. You guys worked like a finely-oiled machine.